vocabulary and conversation information for each level. So you can choose the one that best suits your needs and goals. 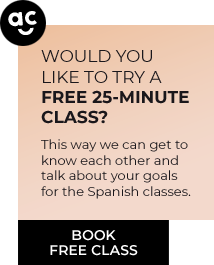 In addition to strengthening the skills you have, you improve your level of Spanish. And if you want to study a little more and learn faster, I can send you homework and in the next class we can correct it together. It is a good way of clearing up any queries and consolidating your skills. These classes are designed for students already at A2 level, since a foundation is required to be able to communicate. You can choose a subject that interests you or I can choose one for you, keeping in mind your level and your goals. In Conversation classes you will express your ideas and I will correct you (if you want), but I will never judge your opinions. Respect and tolerance are highly important to me. If you want these Conversation classes, keep in mind that the goal is for you to talk! Grammar issues are not addressed in these Conversation classes. This is a blend of Conversation classes and ‘À la carte’ classes. In addition to practising conversation, we also address any issues – especially grammar – that may come up. And I give you all the time you need to gain a good understanding of them. You can take home additional exercises to brush up on the contents giving you the most difficulty. Diplomas of Spanish as a Foreign Language (DELE) are the highest ranking official international certificates attesting a degree of competence and mastery of the Spanish language. Additionally, a major plus is that they never expire. They are for life! There are bounteous reasons to get your diploma. In many countries, the DELE have been adopted by the educational authorities and regulated educational institutions as a supplement to their own assessment programmes. They are ideal for facilitating career advancement and access to education both in Spain and in the rest of the countries where the tests are offered. If you want further information on the different tests, click on the level that you are interested in –A1, A2, B1, B2, C1, C2– to go to the official page of the Instituto Cervantes. Through these classes I can help you to prepare and pass all the parts of the exam at all levels. We will particularly work on grammar, listening skills and the resources used to successfully pass the oral exam. You can do the reading and writing comprehension tests at home and we can correct them in the following class, to clear up any queries you may have regarding the lexical contents, etc. I am a DELE examiner, so I am qualified to build upon your strong points and to balance the rest. This is a blend of special DELE classes and ‘À la carte’ classes. The Combo Plus is good for students with shortcomings in grammar, writing, listening, vocabulary, etc., and who are preparing for the DELE. With ‘À la carte’ classes we would address any difficulties and with DELE classes we would prepare for the specific exam. Thus, we would compensate for the imbalance between skills. 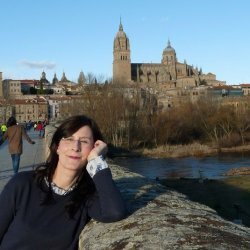 If you are planning on travelling to Spain, in the city of Salamanca you can learn a refined and accent-free Spanish, making the understanding and language learning easier. I offer one-on-one classes or those in small groups of 2 students at my home, which is very near to Salamanca. Firstly, we would meet in person and I would give you a short interview to assess your level and what you want to study with me. The classes are tailor-made to suit your level and what you want to strengthen, be it conversation, grammar, pronunciation, broadening your vocabulary or preparing for DELE exams.